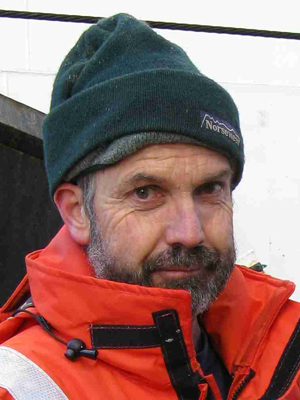 As a principal investigator on the seamounts voyage, Malcolm Clark is leading a watch, and helping to plan and direct sampling operations. Ships with echo-sounders, especially modern vessels with multibeam swath-mapping systems, can map the bathymetry of the seafloor and detect even small seamounts with incredible detail and accuracy. These ships send out a fan of acoustic signals either side of the ship, and integrate the return signals that bounce off the hard seafloor and can map the seafloor over areas much wider than the vessel track (see figure).Although you can’t see them under the water, seamount features are one of the most common forms of topography throughout the world’s oceans. They are essentially undersea volcanoes, often defined as being more than one kilometre in height, but ecologists recognise them as important and distinct even when they are as small as 100 m in elevation. Imagine the variety of landforms that occur on land, with large mountains down to hills . . . that sort of topography is mirrored in the seascape several kilometres under the sea surface. However, the oceans are vast, and only a small proportion of the ocean area has been surveyed. While echosounder detection is necessary for the smaller seamounts, larger features can be observed indirectly from space. An earth-orbiting satellite with radar altimetry sensors can measure the height of the ocean surface, and variations in this caused by seafloor topography. If the seafloor was completely flat, then so too would be the ocean surface. However, the seafloor has lots of irregularities just like the land, with negative ones such as trenches and canyons, and positive ones like ridges and seamounts. These result in small perturbations of the earth’s gravity field because of changes in geology (such as dense basalt rocks of a volcano) or topography (large deformation of the seafloor). This results in an anomaly between the measured and theoretical ocean surface (see figure), and can show where seamounts occur many thousands of metres under the surface. This approach has been used to create bathymetric grids of the entire ocean seafloor, complemented by more detailed echosounder measurements. The first grids were compiled in the late 1990s at a spatial resolution of two minutes (a dataset termed “ETOPO2”), but satellite data has since improved to enable this grid to be created at much finer 30 arc-second resolution (“SRTM30”). The availability of a complete ocean-scale grid enabled algorithms to be developed to identify seamounts in most parts of the ocean, even where ships had never been. A common algorithm involves taking the summit position of a potential seamount, then laying out eight radii of 20 km, spaced at 45 degrees: depths in each cell are assessed against several criteria that define the shape and size of the feature. If all are met, it gets classed as a seamount. The global distribution of seamounts. Source: Consalvey et al. 2010. Although similar grids have been used in different studies, the estimates of seamount numbers vary depending on the mathematical model used, and the degree of extrapolation into areas that are poorly sampled or not well covered by satellites. The number of estimated large seamounts (higher than 1 km) range from 10,000 to several hundred thousand; and for smaller seamounts (knolls and hills down to 100 m height) numbers range from 100,000 to tens of millions. There is no single “right” answer, all these estimates can be justified. However, there is a similarity in estimates from several studies, and those using the best available data and robust algorithms suggest about 35,000 large seamounts, and about 140,000 small seamounts. 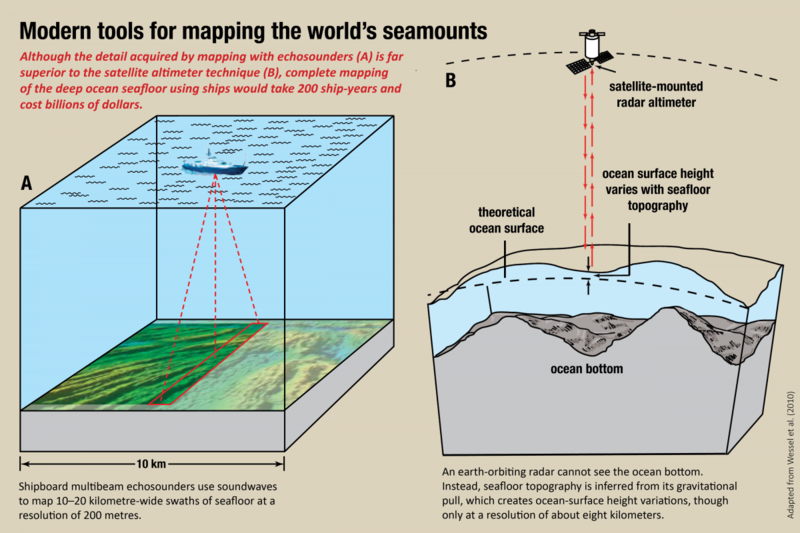 The numbers of seamounts differ between oceans. The Pacific is the ocean with the largest number of these features (60% of large seamounts, 50% of small ones) and the south-west Pacific is especially rich in smaller features. There are well over 100 of these types of features in the Tasman Fracture Zone and Huon marine parks. Most were mapped with multibeam echosounders off a CSIRO vessel in 2006, and hence their location and characteristics are well known. This is an essential foundation for the type of detailed survey work we will be conducting, and you will learn more about from this voyage. We reached our first sampling station last night (Pedra seamount), after testing the cameras in shallower water and had a successful tow from the peak of Pedra Branca to the base and then out on the flat at about 1400 metres. We didn’t see much coral but it was good to see the cameras work. The next couple of camera transects did not go as well with some technical issues arising as a result of a knock against the side of the ship as the camera sled was retrieved in the sizeable swell. 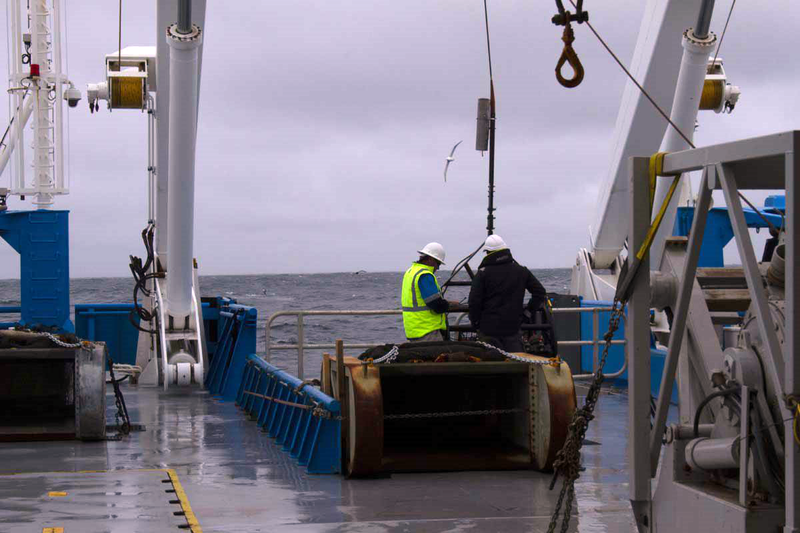 Protecting delicate high-end technology as it dangles at the end of wire cables with tons of metal in the vicinity, or even worse as it is dragged across the seafloor thousands of metres behind the vessel is a perpetual challenge with sampling the deep ocean. The delays in camera operations meant that we had time to carry out a beam trawl to collect invertebrates from the seafloor at 1700 m depth, enough to keep the taxonomists busy for a little while. We ended the day with a successful camera transect down a small seamount (Z16) which peaks at 1000 m. Excellent imagery and excitement as the top of the seamount came into view with a dense cover of deep-sea corals and associated animals and some fish including orange roughy. We towed down the flank with the coral thickets thinning at 1300 m and disappearing by the time we reached the seafloor at 1400 m. We save what was perhaps the most exciting part of the day until the last as we noticed a small ridge rising to 1267 m from the seafloor and only a kilometre away from the base of the seamount. Would this small ridge support deep-sea corals? It is too dangerous to tow the camera up any decent incline (too much chance of it getting stuck under a ledge), so we raised it to 1250 m steamed to ridge and flew it down to the peak. Imagine our excitement when a dense cover of deep-sea coral came into view. It was a satisfying end to our shift and answered one question that we had: do deep-sea coral communities in this area extend beyond the seamounts? Now we just need to know by how much. It's lucky that we have another 100 camera tows ahead of us – that is if we can keep the gear working.